What needs explaining? He's japanese. it's pretty nice that the Japanese have made accommodations for vampires in there subway systems. He's dead. They had to stow him away somewhere, right? Red Bull, It gives you Wiiings! 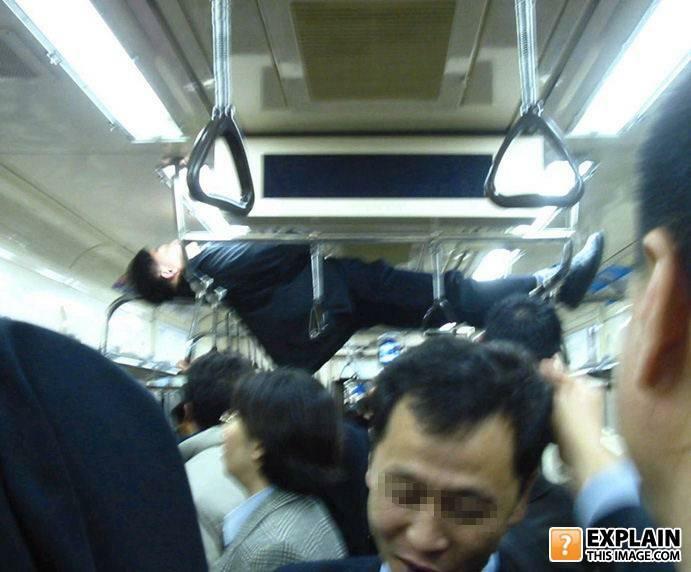 Even on the bullet train, planking is a lame hobby. Who's the guy with the blurred eyes? after being evicted from the batcave, bruce wayne claims squatters rights. Now what would a pickle be doing in a subway? I knew Asian people's eyes were different, but I've never seen pixelated ones. wake-up me when we get okay?! On second thought, trampolines on the subway was a bad idea. tryin to catch some Z's on the way to work, clearly. "So, you're saying the train is full?...Think again!" Crowd surfing the japanese way. hey, at least he's not driving! Epic fail on secret ricin attack. A mobile apartment with no rent. they dont need to blur his eyes, theyre all the same person. omg that guys eyes are blurry you know the one in front of the floating guy omg blurrry!!!! This is how the Japanese plank! The old ladies took all the other seats. I'm not gonna stand around like those other suckers! I'm the smart one. Do you think anyone would notice the dead body i hid? Welcome to "affordable" housing in Tokyo. Come on you guys, all you need to do is to think happy thoughts. We all know how their eyes looks like anyways..
Lots of space up here. i'm just gonna nap right here. no big deal. Hey, I´m just hanging around. This is transportation of the future. The Japanese float belly up when they die. Wasn't this a scene from inception? the mafia got to him. Hanging about: better than waiting around. Planking, you're doing it wrong! obviously there wasn't anywhere to sit! And really aggravate my allergies.